Once you've connected Leadfeeder to Pipedrive it's very quick and simple to connect interesting leads to Pipedrive as often as you like. 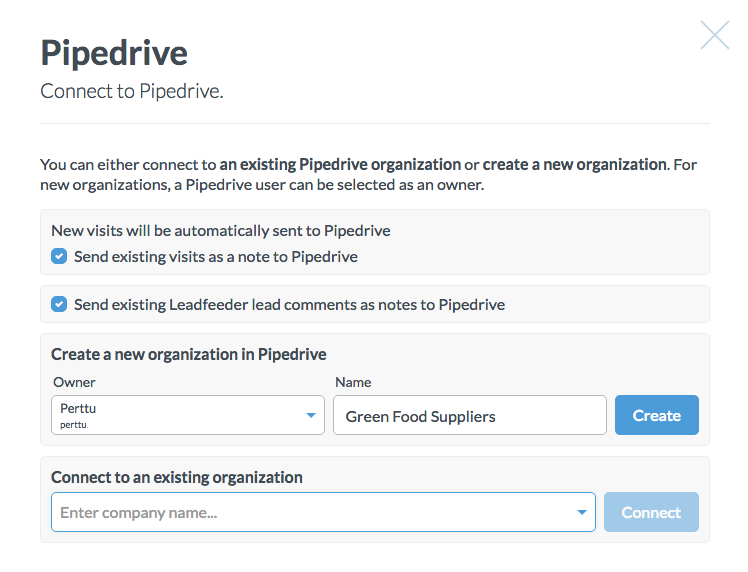 You can also create new Pipedrive deals from inside Leadfeeder. It's recommended to link as many Leadfeeder leads as possible to Pipedrive because Leadfeeder automatically creates a new note for that organization in Pipedrive every time the lead re-visits your website. STEP 1: When you see an interesting company in Leadfeeder, click Connect. STEP 2: You'll come to the following screen where you can Create a new organization in Pipedrive or Connect to an existing organization. If you prefer, you can send existing visits to Pipedrive as notes. You can also choose the owner. STEP 3: Once the organization is connected you can create a New deal or New activity in the Leadfeeder interface. 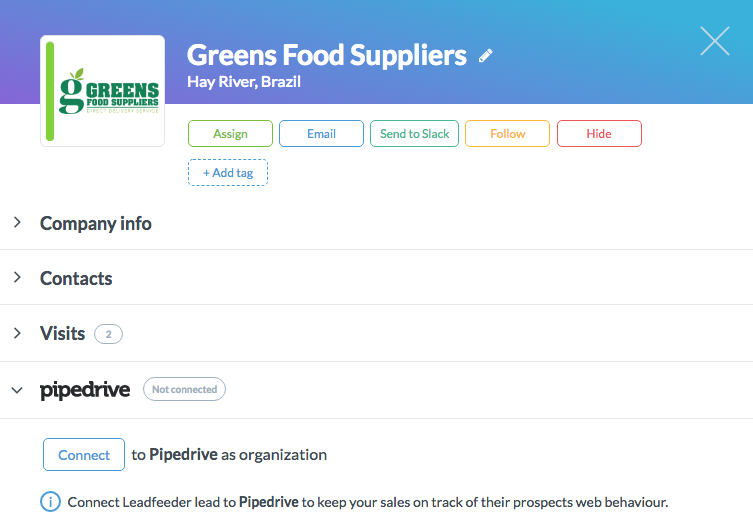 Connecting a lead in Leadfeeder to an existing organisation (or new organisation) in Pipedrive means that whenever that company re-visits your website the details of their visit will show up in Pipedrive automatically. The screenshot below shows how Leadfeeder automatically creates a note in Pipedrive after a company re-visits your website. 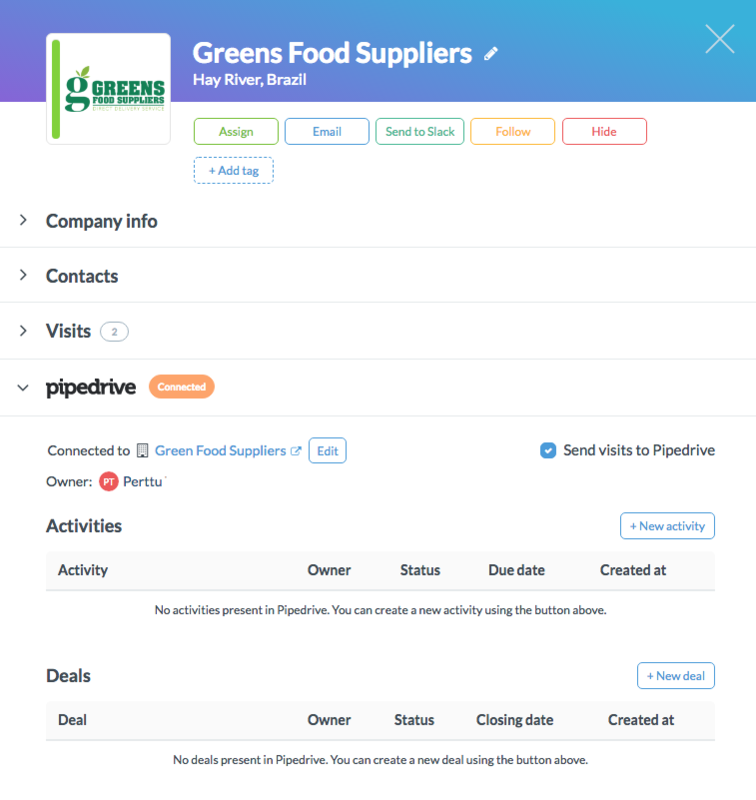 Leadfeeder will automatically create a note in Pipedrive with all company's history visits after the user initially connects it to Pipedrive. You can also find a link to Leadfeeder as a custom field where you can see all the information related to this organisation in the Leadfeeder app interface. If you have a deal for that organisation you will automatically see the visit note in both deal and organization. How does digital analytics company Quru use Pipedrive and Leadfeeder to simplify sales?